BNEF has significantly increased its forecast for global deployment of behind-the-meter and grid-scale batteries over coming decades. London and New York, November 6, 2018 – The tumbling cost of batteries is set to drive a boom in the installation of energy storage systems around the world in the years from now to 2040, according to the latest annual forecast from research company BloombergNEF (BNEF). 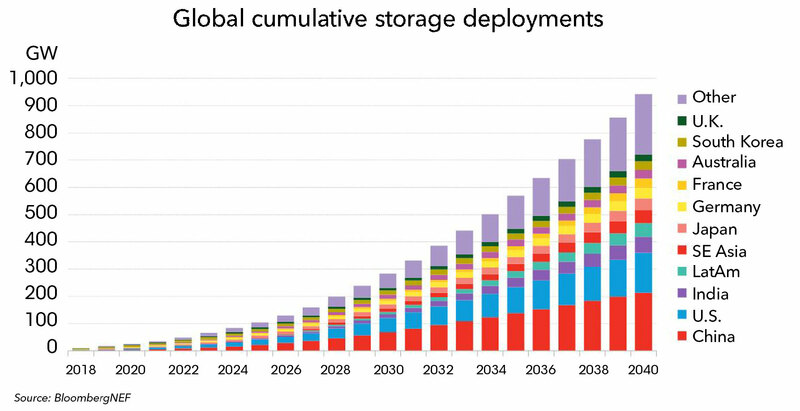 The global energy storage market will grow to a cumulative 942GW/2,857GWh by 2040, attracting $620 billion in investment over the next 22 years. Cheap batteries mean that wind and solar will increasingly be able to run when the wind isn’t blowing and the sun isn’t shining.